University of Virginia Library Online Exhibits | Robert E. Lee to William Gordon McCabe. 1870 February 9. 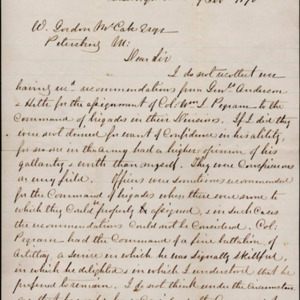 Robert E. Lee to William Gordon McCabe. 1870 February 9. “Robert E. Lee to William Gordon McCabe. 1870 February 9. ,” University of Virginia Library Online Exhibits, accessed April 20, 2019, https://explore.lib.virginia.edu/items/show/2249.